Come for the ostentatious splendor, stay for the foreign policy. On Saturday, as President Donald Trump was hosting Japanese Prime Minister Shinzo Abe at Trump’s private Mar-a-Lago club in Palm Beach, news broke that North Korea had launched a ballistic missile into the Sea of Japan. CNN was the first to report last night that Trump was joined at the dinner table by his embattled national security adviser, Mike Flynn, and chief strategist Stephen Bannon. As Mar-a-Lago members dining separately looked on, they reviewed classified documents with Bannon and Flynn using their cell-phone lights so Trump could see what he was reading. After that awkward exchange, Trump and Abe held a hastily assembled joint press conference where Trump made a statement that was shorter than his awkward handshake with Abe at the White House on Friday. What did Trump do after that? Bunker down with his National Security Council? Spend the evening on the phone with his Defense Secretary James Mattis? No. 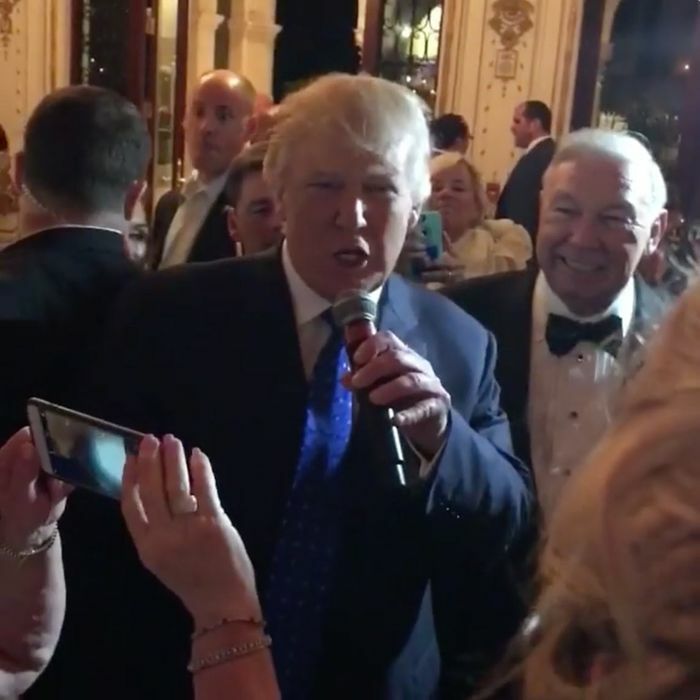 CNN reported that Trump dropped by a wedding that happened to be taking place at Mar-a-Lago, took the mic, and spoke to the guests. Daily Intelligencer has obtained a video of Trump’s impromptou speech at that wedding and is also the first to report the names of the couple: Carl Henry Lindner IV, 33, and Vanessa Jane Falk, 36. Lindner, an Ohio native, is the scion of a powerful Ohio family that owned the Chiquita banana brand and eventually moved into the financial services business. Lindner’s father, Carl III, is the co-CEO of American Financial Group, which has tens of billions of dollars in assets. In the video, Trump can be heard wishing the couple well and saying “I saw them” — referring to Lindner and Falk — “out on the lawn today and I said to the prime minister of Japan, I said, ‘Come on, Shinzo, lets go over and say hello.’” CNN’s report said that Trump also said of the newlyweds: “ ‘They’ve been members of this club for a long time. They’ve paid me a fortune.’” In the video that New York obtained those words cannot be heard. But Federal Election Commission records reveal that Lindner’s father contributed $100,000 to two Trump super-PACs. In early October 2016, he contributed $50,000 to the Future 45 PAC and in late October he contributed another $50,000 to the Make America Number 1 PAC, which was founded and controlled by the reclusive megadonors Rebekah Mercer and her father, Robert.